Specifically written to make many mods ore-crushing compatibilities extended! With this, mods like ActuallyAdditions and ExtraUtilities can do more with mods which add ores and ingots, but not dusts (such as Embers and Forestry). 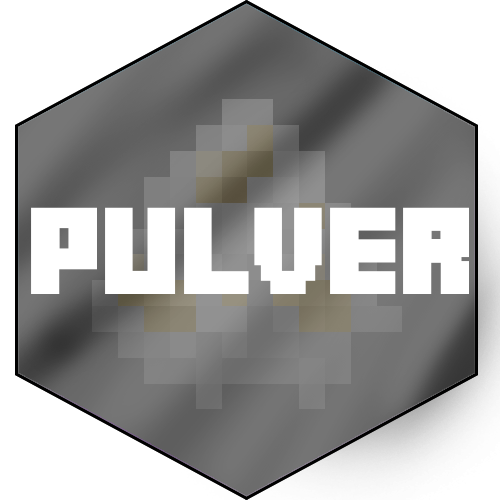 Pulver doesn't register any crushing recipes itself, just adds ore dicionary dusts for these other mods to use! There is no configuration file - all dusts are automatically (and precisely) generated, as is their texture! Re-texturing and translations are welcome! Thanks to Mezz's JEI for the code I used to get automatic colorization functioning!